This is why we created Podcasting University. This workshop is designed to enable novice podcasters to successfully plan, record, edit and launch their first podcast episode. By the end of this workshop, you will have your first podcast episode recorded, edited, ready to upload and distribute to iTunes! Before you enroll in Podcasting University, you will need to take the following prerequisite course. MORE DETAILS: This approximately 2-hr workshop is required prior to enrolling in Podcasting University. The 101 class is a comprehensive overview of Podcasting and Videocasting and is offered several times throughout the month, weekday evenings and weekends. MORE DETAILS: This class will be offered Saturday or Sunday for approximately 6-hours (ie. 10:00 am-4:00 pm). MORE DETAILS: You will have 10 to 12 days to record your FIRST EPISODE. Microphones will be available to rent between classes, if needed. Limited supply is available so those that RSVP first will get preference. MORE DETAILS: This class will be offered the following weekday one evening for approximately 3 hours (i.e., 7:00-10:00 pm). You will need to bring a laptop to this class. Online courses are great because they allow flexibility and we are in the process of developing online courses to meet the needs of those who prefer that model. With that said, some people need a more personalized approach that can only be provided in-person. Our goal is to meet the needs of those people with our face-to-face workshops. 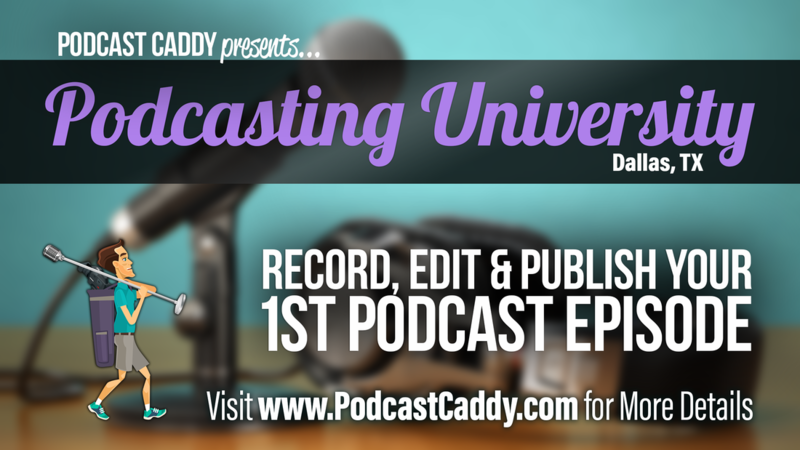 Podcasting University was created to meet the needs of people like you who are ready to start their podcast or videocast but need some guidance and support to make their vision a reality. Ultimately, this is the class we wish we had when we started our content creating journey. This is why Podcasting University is ideal for anyone who is truly serious about starting their podcast and/or videocast. With just a one day and one evening commitment, you will have your first podcast and videocast recorded, edited, uploaded and ready to share with the world! LIMITED SPACES AVAILABLE SO RSVP TODAY! Do you have a group of friends ready to start and want to take this class together? ​Great! We have discounted Team Rates just for you. Teams are limited to 4 members.